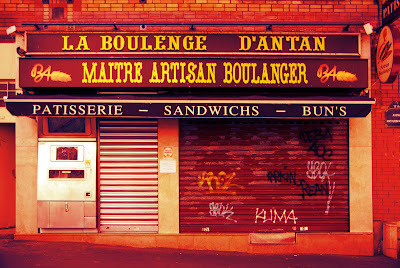 ParisDailyPhoto: Where to find a baguette at night? Not the most glamorous photo posted on PDP? I agree! I even had to cheat a bit with it for the original was really... well... not nice! But the reason why I posted it, is that there is something truly Parisian in it - and truly unique: a baguette vending machine (on the left hand side)! Yes, people, a boulanger (baker) managed to create a baguette dispenser that can operate 24/7 (it's more than a dispenser actually as it completes the cooking when you pay, so that it's crunchy like a fresh one). Think of all the poor Parisians who crave for a baguette at 4am! Now they know where to go: 20 Avenue Mathurin-Moreau in the 19th arrondissement. That is fabulous! I wish my local Git 'N Go would install one of these. All we get at 4 a.m. is dried out hot dogs and imitation cheese product nachos. The only thing edible I ever got out of a vending machine was popcorn. (to be eventually popped). This, tho, is too yummy for words. All it needs is fleur de sel butter. So in Paris you guys have ATMs and ABMs!!! Now I have seen everything! I could believe a macaron dispenser, but baguettes? Magnifique! Well, next time I'm walking near the canal at 4 a.m., I'll give it a try. Yeah, I saw this on the France24 news last week. I was wondering how long do you have to hang around waiting for it to cook. They interviewed a few people on the news but none of them had tried this new convenience and they sounded like they had no intention of trying it. Over all, bad reviews. Poor *Parisians* craving a baguette??? How about poor Parisian hearts that have been away from fairy tale bridges, awe-inspiring monuments, and perfect bread way too long? (Sorry, but it had to be said. ;) ) Seriously, I think this is an outstanding idea, and I can only hope that such entrepreneurial spirit will persist until some smart person finds a way to dispense genuine Parisian baguettes abroad! Eric, I actually think this is a cool photo. I like what you did with it! Yes very cool pic and concept. But Eric, what exactly does "boulenge" mean? @Monica. ABM LOL! I love that! @Michael. 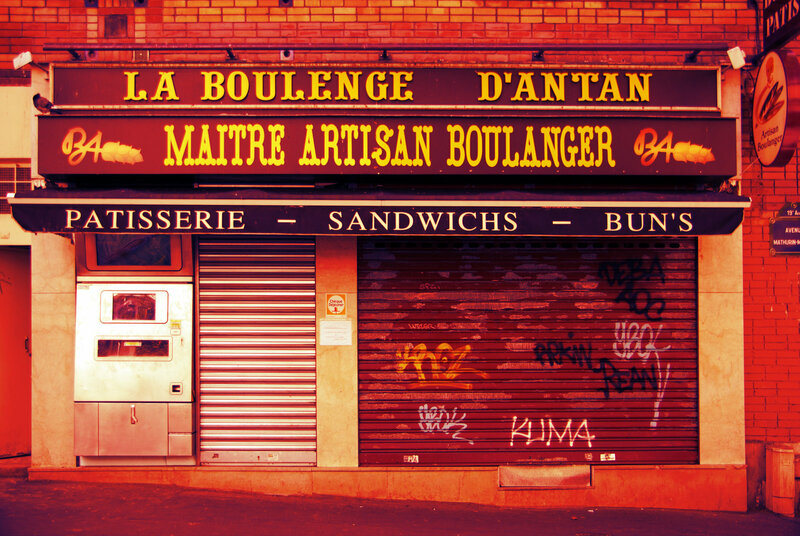 La boulenge - which is normally spelled La boulange - is a bit of a slang word when talking about the trade. ie "il est dans la boulange" we would say, meaning "he is in the making bread trade. I'm stoked to have found an authentic french boulangerie/patisserie down here in Brisbane, Australia and plan to become a regular now...help me practice ordering for when I'm in Paris in January! So Eric you got into trouble because of this photo. I wonder if he thought that you were a spy from another boulangerie ? I love the photo and the thought of freshly baked baguettes. I see this place also sells "patisserie", "sandwichs"<-without an 'e' I might add, and "Bun's". I'd like to know whose bun? @Bettina. Nah I did not really get into trouble. Only the guy started mentioning "Image rights", saying that the press "pays millions for photos of car prototypes before everyone" bla bla. I did not want to get into a fight with him and argue that this was not exactly a secret car prototype, but just a dispenser visible to everyone, etc. Just plain ridiculous. People see that celebrities get money when they sue magazines in France and they think they're entitled to do the same. Sad. I thought it was interesting that the employee didn't want publicity for their new machine. Did they think you were a rival boulanger trying to steal their idea? You should have told that mean guy that you were a 'photagger' and that just after taking the photo, you were going to add some real flavor to his baguettes, and if he didn't get out of the way, you'd tag him too! Personally speaking, finding a baguette in Paris at 4am has never been top of my list of priorities, but then again, I'm not a Parisian. You take your half-baked baguette and you shake it all about. Everyday I enjoy your beautiful pix, and your personal charm, adding them to my own perfect memories of Paris. Merci, merci, merci - vous etes tres tres gentille! Oh Drummond, we know if it were a champagne distributor you'd be singing a different song! Anderson Cooper said, "be glad it wasn't Gérard Depar-doo". I think it would make a great painting! That is really cool! You French are always coming up with really great innovative ideas. Eric, I LOVE the colors in this photo. It may not be a typical tourist shot, but it's a great pic. And I have to say, I wish you hadn't 'cleaned' it up:) I'm curious - do the French cuss and say dirty things in English and then say, "Excuse my English?"!ha! My first night in Paris way back in 1993, I was sitting on a hostel step, trying not to cry [no room for me and a big misunderstanding despite international phone calls before I arrived, etc.] Anyway, two young French men at a table talking so animatedly and all I could understand was the "F" word. And they said it repeatedly with such a wondrous French accent. It was downright cute!